European fairy-tale references abound throughout THE NISSERA CHRONICLES, particularly the ones adapted into Disney movies: Kingdom of Ash and Briars appears to have contained elements of Cinderella and Sleeping Beauty, while Realm of Ruins has sub-plots taken straight from Beauty and the Beast and The Little Mermaid, along with some clear nods to Tolkien’s Lothlórien and its own source material, the kingdom of Elfland featured in Thomas the Rhymer. These inspirations, however, are simply plunked on the page with little modification or personalization for the story at hand, and West doesn’t look at the tales from fresh, interesting angles, or handle them in any way that I haven’t seen before. The plot itself is rather straightforward, but the pace is maddeningly slow, in order to make room for those familiar sub-plots. A magically-bereft young woman of royal blood is training at a magical academy intended exclusively for elicromancers, immortal sorcerers who possess special stones and magical specialties; she is bestowed with tremendous, unheard-of power through a sudden accident; her sudden display of power nets her expulsion from the academy, which sets her upon a quest to renew her status among the elites. Meanwhile, a secret group known as Summoners are working to revive a long-dead evil tyrant, and a mysterious young man beset by visions may be the key to defeating him, though his claims of being a time-traveler and his refusal to honestly account for himself ought to set off warning bells for anyone in his vicinity. Tonally, Realm of Ruins is all over the place, jumping from frothy descriptions of wardrobes full of elaborate gowns, and lavish parties stuffed with immortal people who stopped physically aging in their late teens, to gruesomely detailed scenes involving the consumption of living viscera, and then right back to teenagers flirting with one another in moonlight. I’m not the first person to make the old joke that the Grimms’ tales were always grim, but West can’t seem to make up her mind as to what kind of story she’s telling, and the end result is both confusing and off-putting, like if Eli Roth or Rob Zombie guest-directed a few episodes of a magically-themed teen soap opera. The final third of the book picked up in pace and caught my interest a little as everything began coming together, but by then I just wanted it to end. 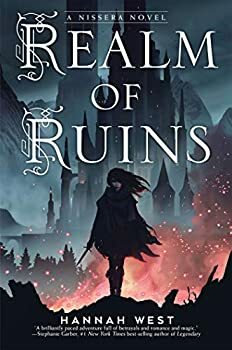 Realm of Ruins brings nothing new to the table, either in terms of the YA fantasy genre or modernization of classic fairy tales. I won’t be seeking out any of the rest of THE NISSERA CHRONICLES. Published in December 2018. Welcome to Nissera, land of three kingdoms and home to spectacular magic. A century after her legendary ancestors overcame a bloodthirsty tyrant, seventeen-year-old Valory Braiosa attends a training academy for elicromancers, immortal beings with magical gifts. Yet Valory’s immense power seems impossible to tame, and she faces imprisonment by the Nisseran authorities. Then a forbidden resurrection spell awakens a long-dormant evil, and Valory may be the only one who can vanquish this terrifying villain. Together with a band of allies—including an old friend; a haughty princess; and a mysterious, handsome stranger—Valory must learn to harness her power and fight back. Weaving together her imaginative world of magic with snippets from Beauty and the Beast and other classic stories, Hannah West’s gritty adventure is a thrilling, immersive companion to her acclaimed debut. 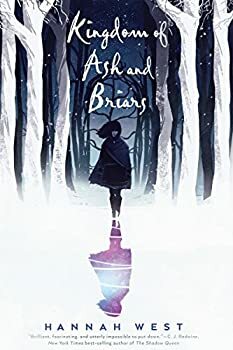 Read this first and then discover the rest of Nissera or start with Kingdom of Ash and Briars—either way, you’ll love the journey. Richly packaged hardcover edition includes an illustrated family tree, detailed map of Nissera, and embossed jacket with shimmering metallic effects.